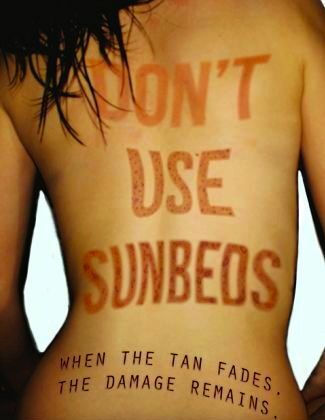 The bronzed babe behind the desk at the indoor tanning salon will probably tell you that gradually building up a tan by using a tanning bed will provide protection from a sunburn, but don’t believe her. Tanned skin is damaged skin. And damaged skin can lead to skin cancer. The University of Minnesota’s School of Public Health and Masonic Cancer Center recently reported that frequent use of an indoor tanning bed increases the risk of melanoma (the deadliest type of skin cancer) by 74 percent. Our go-to dermatologist Dr. Lisa Kellett of DLK on Avenue in Toronto says, “A base tan offers only minimal protection, so the risk is not worth it.” Just how measly the protection? It’s estimated to be roughly equivalent to sunscreen with a SPF of 2-3. Recall, it is always wise to aim for a sunscreen with at least 30 SPF to protect yourself from UVB (the burning rays) and UVA (the aging rays), says Kellett. According to the World Health Organization, the UVA rays used in indoor tanning salons penetrate the skin deeper and can still contribute to skin cancer. Another lie you may hear at the tanning salon? Rays from the bed are not as damaging to your skin as the sunlight is. Truth is, there is no evidence to support claims that UV exposure from tanning beds is any less harmful than UV exposure from the sun. Mayo Clinic researchers believe that the use of indoor tanning beds is largely to blame for the dramatic rise of skin cancer among women under the age of 40. It is estimated that young people who use sun beds are twice as likely to develop melanoma, and that risk rises by 20 per cent for people who use a sun bed at any stage in their lives! 79 queries in 0.901 seconds.